Dangerously close: Alexander Matthews’ social drama set in a South London Indian Restaurant just about skirts stereotyping. Glass Roots, Tristan Bates Theatre. Photo: Rory Lindsay. Dreamy Sadjit (Kal Sabir) and his wife Thila (Natalie Perera) run a successful South London Indian restaurant. But they are at loggerheads. From amid the overbearing brown and yellow of the ’70s decor, he dreams of more – so much so that his literary ennui won’t allow him to answer the phone for fear his inspiration will abandon him. He’s poetry’s Buddha of Suburbia. The Bard of Beckenham, or something. Depending on whether you’re a feminist with your heckles up or a misogynist, middle-aged, white man, Thila is either a put-upon wife or heroically bolshy. She answers the phone because they’d go under otherwise. She is practical. This tried-and-tested – and tired – dynamic quickly becomes lumpy. The couple’s supposedly sparring dialogue turns into discourse as the they bounce their way through an unconvincingly reasoned and emotionless row. Challenges to their wanted/unwanted cosiness come in the form of a posh-walking disaster of couple – barrister Rupert (Ben Warwick) and “free spirit” Celia (Victoria Bloom) – who bicker over the best way to treat brown people, and in particular, brown people who serve you (Her, well-meaning but patronising; him, a sneeringly self-proclaimed “honest” superior). Deeply buried among all the talking is a plea for inclusion, but it’s been strangled by long, sort-of philosophical exchanges and rhetorical flourishes, the likes of which are not often heard over an aloo saag in South London. Both Rupert and Celia are awful, and their awfulness is played with absolute aplomb by Warwick and Bloom, who seem to have a blast with their banter. Sabir and Perera show similar gusto, only their Sadjit and Thila are both quite likeable. At times, dramatic parallels draw dangerously close to stereotype in Alexander Matthews’ play: spoilt, white, rich people versus honest, hard-working immigrants. More trouble – and troubling stereotypes – arrive in the form of our third pair, two bovver-booted white racists, who remind us that intolerance comes packed with an actual punch, not just a verbal one. There is more debating, but at least the duo can’t be said to wholly conform to type. Diesel, played by Mitchell Fisher, has an excellent way with words and a pretty sharp mind. 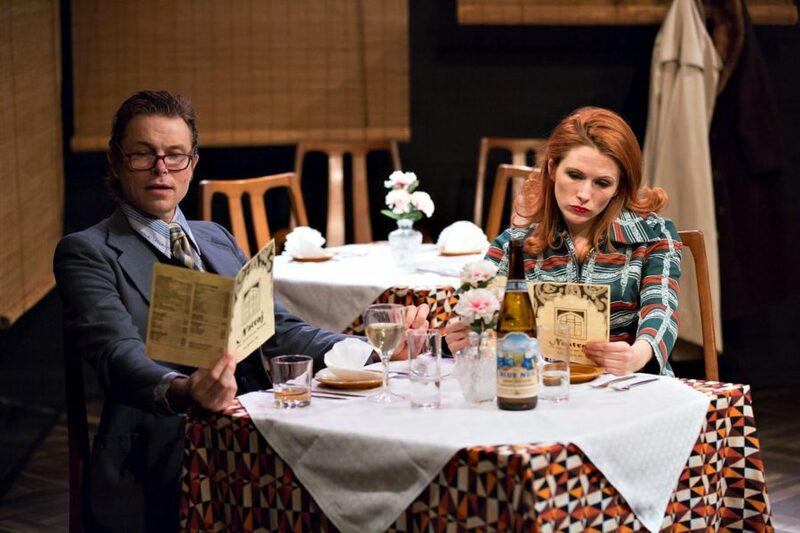 This third, unpredictable pair bring some real drama, stalking the restaurant set with menace as the wild-eyed Spaceman (Sam Rix) bizarrely bothers Celia’s fur-trimmed coat. Yet their aggression is met with unsettling calm by the both couples being subjected to it, until there is an unlikely about-turn from the previously passive Sadjit, who decides to show the pair of prats compassion and understanding. While this strains at logic and psychological realism, it does provide another excellent opportunity to debate ideas. But, surprisingly, Glass Roots doesn’t bore, despite its flaws. While it might not illuminate issues or inspire reflection in the way it obviously wants to, the show itself is a neatly packed and sleekly directed. The cast of six make a virtual ballet of navigating tables, chairs, entrances and exits. Floppy hats and flares stay the right side of dress-up and feel authentic and fun. At a speedy 70 minutes, it doesn’t really hang around long enough to offend, and the charming performances wouldn’t allow it to anyway. Glass Roots is at the Tristan Bates Theatre until March 24th. For more details, click here.